Just a whisper the word “cashmere” sends me into swoon mode – it is one of my absolute favourite fibres to wear, as evidenced by my cashmere-heavy wardrobe and sagging bank balance! It just screams luxury, cocooning and care, and when I heard there was a skincare release with “cashmere” in the name I had to find out more. Called – wait for it - Drops of Crystal Cashmere Touch Serum, it is the luxurious second step in the rather sublime Drops of Crystal range (above) from award-winning skincare name Manuka Doctor. Incredibly light and soft on the skin, the lightweight serum is actually pretty damn grunty, and works to “re-sculpt” the facial contours and revitalise the complexion. It is formulated using botanically derived, quick acting, firming actives that work together to help plump and smooth the skin so imperfections, fine lines and wrinkles appear reduced almost immediately. It also contains a special oil-in-serum composition that boosts the elasticity of the skin and helps it to appear rejuvenated. Purified Bee Venom – nature’s own wonder skin ingredient that is proven to encourage natural collagen formation and visibly increase the skins elasticity. Cassia Augusifolia Seeds - botanicical firming actives that hydrate, smooth and plump skin. Crystal Tears – a pretty name for an oil taken from the resinous sap of the Pistacia Lentiscus tree. Once solidified, these drops take on a crystal shape. These ‘tears’ slow down ageing and makes skin feel firmer, plumped and lifts facial contours. Tomato Stem Cells – to help protect against ageing by reducing oxidative damage and the degradation of DNA. It helps to brighten skin and increase luminosity. * Trial participants found that in 28 days their facial contours appeared more defined, their skin felt firmer and their complexions looking younger. Pretty amazing, huh? 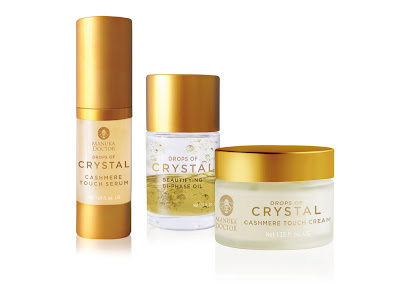 You apply Cashmere Touch Serum preferably after the brand’s Beautifying Bi-Phase Oil, morning and night.